Not sure where to start trying the new GrabPay? We’ve got some suggestions for you. Prepaid top-ups are more rewarding with GrabPay Credits! Just use your Grab app to top up, and every RM1 spent will earn you 1 GrabRewards point. Finally, prepaid top-ups are rewarding again, with GrabPay! Taking rides, ordering from GrabFood and spending your GrabPay Credits in-store will also earn you points, which can then be redeemed for a variety of GrabRewards. Promotion is valid from 19 Feb to 30 Apr 2019. Promotion is only valid for Airtime Top Up with GrabPay Credits. Upon successful payment with all criterias met, 1 GrabRewards points will be credited to users account for every RM1 Airtime Top Up. Promotion is valid for 10 Airtime Top Up per user per month. Get RM5 instant rebate at selected outlets across Klang Valley, Ipoh, Penang, Johor Bahru, Kuching and Kota Kinabalu. Belanja the family without bringing your wallet and enjoy RM5 instant rebate when you spend a minimum of RM10. Choose your favourite from the below, or try them all! Promotion is based on a first-come-first-served and while stocks last basis. RM5 instant rebate is valid with a minimum spending of RM10, ONE (1) redemption per table per day, split bill is not allowed. Limited to TWO (2) redemption per customer, per store. Limited to ONE (1) redemption per transaction, valid with GrabPay Credits only. Not valid with any other voucher, offers or promotions. Offer is not exchangeable for cash or replacements. Grab reserves the right to alter, extend or terminate the promotion and change or amend the terms and condition a its sole discretion at any time without prior notice. In case of any disputes directly or indirectly arising from the promotion, the decision of Grab shall be final. Let GrabPay treat you! Enjoy RM5 OFF a delicious meal at Charlie’s Cafe, located at Taman Bukit Desa, Kuala Lumpur. Make sure to pay with GrabPay credits in order to relish in this awesome deal. Offer is from 15 Feb 2019 – 30 Apr 2019. Offer is only valid for payments using GrabPay Credits. The entitlement of the RM5 OFF is honoured with a minimum spend of RM20 with GrabPay Credits and is limited to a ONE (1) time usage per user. Offer is not valid with any other vouchers or promotions. It is never too early or too late to work towards a healthier you! Head on to any of the La Juiceria brand featured above and get yourself a hearty healthy meal! 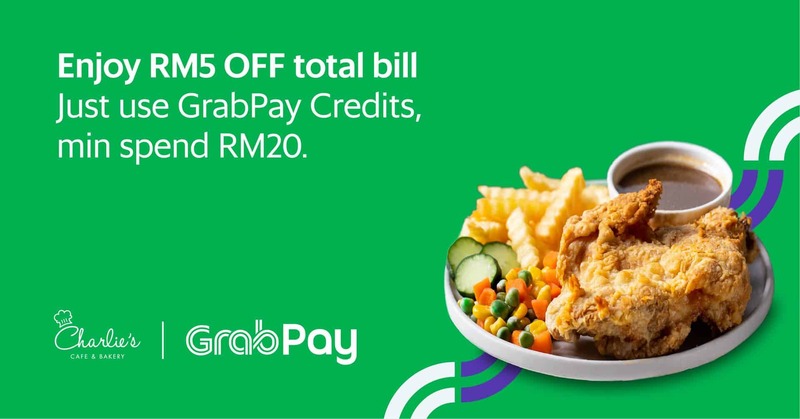 GrabPay Credits your meal with a minimum spend of RM10 and you will be able to get a RM5 GrabRewards Rebate for your next visit. Offer is from 28th March 2019 – 27th May 2019. 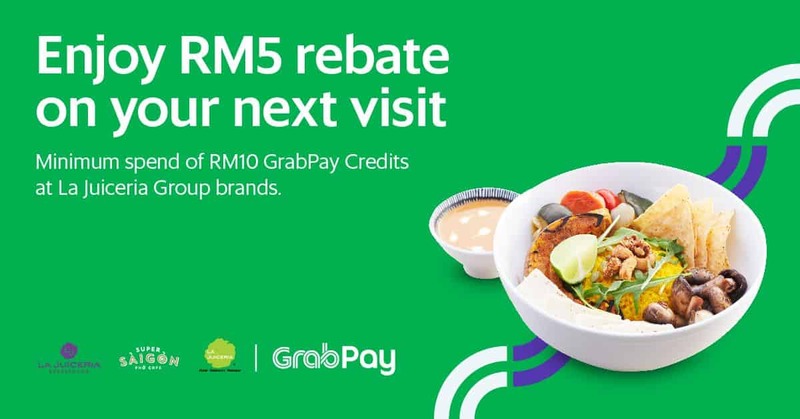 The RM5 GrabRewards rebate can only be used at the brand in which the GrabPay Credits transaction was performed. A minimum spend of RM10 using GrabPay Credits for ONE (1) redemption per receipt is required. Not valid with any other ongoing vouchers or promotions. Not transferable or exchangeable for cash or replacements. Extra arrows, extra fun! 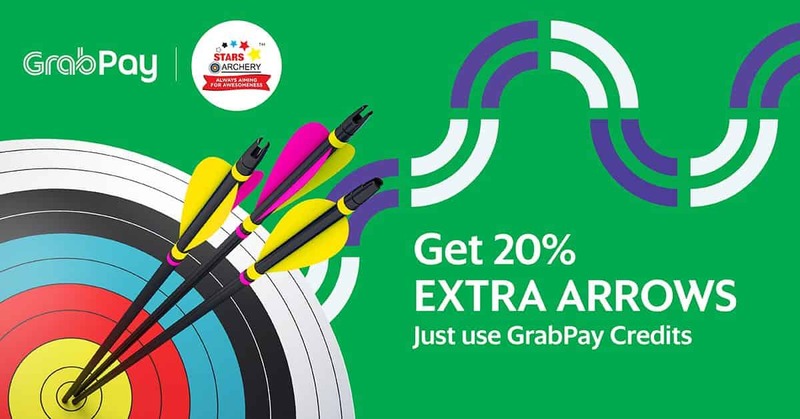 Practice your best shots with an additional 20% arrows when you pay with GrabPay Credits at Stars Archery! Offer is from 25 Mar 2019 – 25 Jun 2019. Only applicable for Recurve Bows. Not valid with any other ongoing vouchers or promotions, non-transferable or exchangeable for cash or replacements. Offer available at all Stars Archery outlets in Malaysia. Grab and Stars Archery reserve the right to refuse, alter, amend, delete or add to the Terms and Conditions or withdraw this promotion at any time without prior notice.